Feeling excited for my first post. However, I would like to share my experience. I am a big lover of traveling and try not to miss every opportunity. My last visit was to London. Here I have listed the 3 restaurants that I loved the most. For breakfast try Dishoom. I enjoed the calm atmosphere as well as the nice breakfast they serve. I love sushi so visited Sushisamba London and liked a lot their sushi. TRy out when there. Hope you also like them . We always go to the one in Piccadilly. It is right in the heart of the tourist district, but very authentic Italian "small plates," and excellent quality. Unusual pastas, pizzas, vegetables, charcuterie, cheeses, seafood, etc. Good wine list, including wines by the glass. It is not cheap -- the bill adds up quickly if you try a variety of things. But it is a wonderful place for lunch or before-theater dining. We'll be in London next year. Any other 'must eats'? Oh, wow. I could write a book. My husband is of Italian extraction, so we tend to eat a lot of Italian food. My favorite Indian place is in Hammersmith. It's called Indian Zing. It is just around the corner from the Ravenscourt Park tube station. http://indian-zing.co.uk/ Menu has all the standards, but also they serve unique seasonal dishes, like wild boar. Back in London near Piccadilly, we are quite taken with the Art Deco-themed Zedel. Another great all-day dining brasserie, and a fun atmosphere. Delicious cassoulet (as a daily special), roast chicken, oysters, and several varieties of choucroute. There's also a delightful small "Bar Americain" on the premises. The same operators have other properties in London, but this is (in my opinion) far and away the best, and the nicest in terms of staff/service. A sleeper -- the cafeteria on the top floor of the Art Deco Peter Jones department store (in Chelsea) has excellent salads and sandwiches -- and real Coca-Cola in small glass bottles. https://www.johnlewis.com/our-shops/peter-jones Don't miss the spectacular staircase! 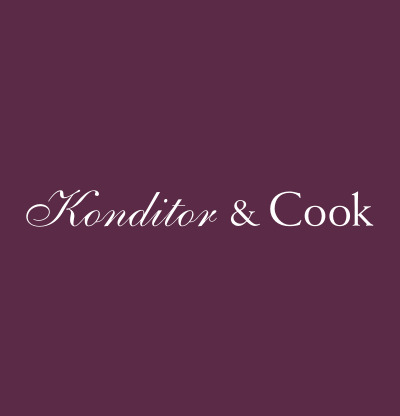 For pastries, Konditor & Cook. I love their "magic cakes," which are lemon-scented petit fours, which often have a theme (summertime includes Wimbledon-inspired icing designs; Christmastime is, well, Christmas-y) They have a number of locations; we usually go to the one near Waterloo station. We lived in London for almost 20 years. Most of the places we frequented are long gone now. However, Y'all must eat dinner at Daquise. The absolute best Polish food outside of Poland. If you go in the fall, have their wild mushroom ragu. I'ts unbelievable! And yes, have the duck! We used to walk to Daquise from our flat on Sloane Ave. I should add, when it wasn't raining. Great Chinese restaurants on Queensway. Across the park. And eat Indian anywhere. It's the best food in London. And be sure you don't miss tea at Fortnum & Mason. IMHO, the best in London. It appears very likely that Pie Diva and I will flying through Heathrow next month with overnight connections each way. On the way over, we'll be landing at 22:45, which will be 3:45 p.m. CDT if I did the math right. We will not be able to sleep or want to sleep. We are looking for ideas for nocturnal fun and adventures, with a return to LHR for a 08:40 flight the following morning. I hear they have awesome 24/7 Kitchen Cabinet stores...w/ shipping to the USA. 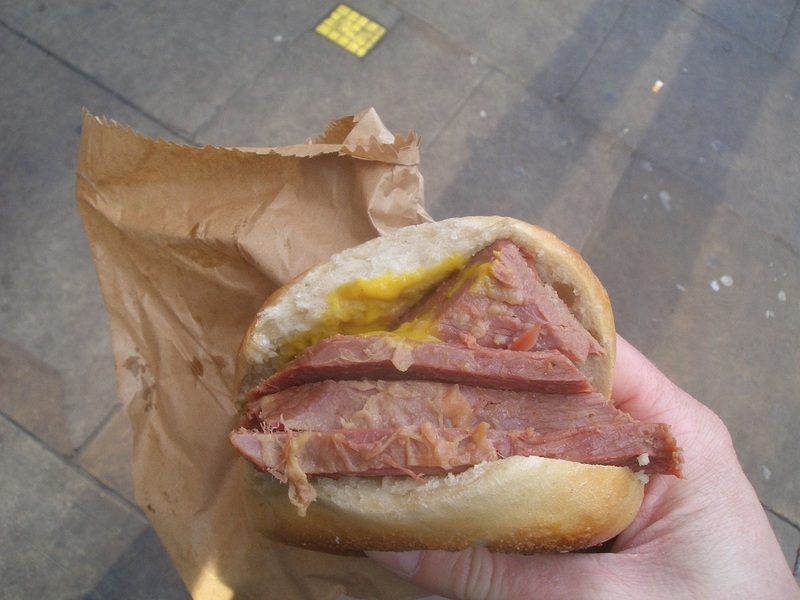 Ever since I saw this picture, I've been fascinated with Beigel Bake, established in '74 on Brick Lane in the East End of London. 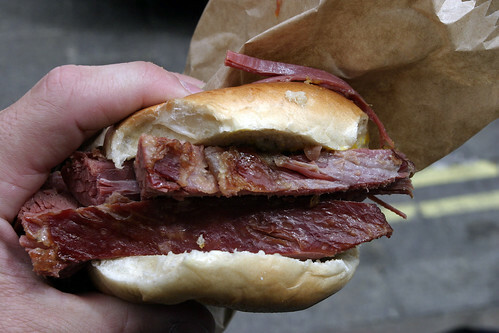 That's their specialty, a hot salt beef bagel. Looks like a lot of folks get it with mustard, gherkins, or both. Amazing!!! What a sandwich. Love a good bagel sandwich. Maybe we should export some pork roll. They'd enjoy a pork roll,egg, and cheese on a bagel! What I love about London is that it has soooooo many great places that even though I go twice a year, most of the places in this thread I haven't been to. If it's not a Friday or Saturday night, aside from clubbing, much of the action dries up at 1am or 2am. Soho has a lot of good late night options as well, especially around Chinatown, but also expect much of that part of town to start closing up at 2:30 am. So, if I had to do this (and didn't have my option of staying with my brother, which is how I usually handle my London overnights), I'd probably check various transit options to try to get to Soho while some of the Chinatown places are open (especially the Experimental Cocktail Club! ), get some light eats and just wander around Chinatown, Soho, and Leicester Square. Then catch a Night Bus to Liverpool street, and check out Duck and Waffle and maybe the Spitalfields area and the other few 24/7 joints. Then slowly work your way back to the airport. We will arrive on Saturday at 22:40 and fly out Sunday morning at 8:20. Even a late night drive to see the sites would be a pleasure. Customs/immigration will take some time unless you have an EU passport and/or get a FastPass (for business/first class passengers). I would make room for a High Tea at Harrods...a true English experience!! To avoid a possible mis-interpretation, the actual experience one wants at Harrods (or Fortnum and Mason, or several other posh establishments) is an "Afternoon Tea". This is the experience with tea served with trays of dainty little sandwiches, sweets, and the like (also known as "low tea", actually). If you just want tea and a lighter snack in a formal setting, ask for a "cream tea" (usually tea, cream, and scones). "High tea" is actually intended as a meal with meat served with tea. One could do an entire exposition about the various, and overlapping terms of tea. I think you should seriously consider hiring a car and driver for this adventure. Yeah, this is good advice. While sometime pricey, another key bit of knowledge you'll get from a good driver which places are actually open at night. There are many cities that never sleep. London isn't at the top of the list. This just got easier, we changed flights. Now arriving 8:30 on Sunday, departing 24 hours later. Our first option will now be to socialize with my English cousins, but something else may get squeezed in. Yeah, that's much more doable. See if you can go someplace for a Sunday Roast. Hawksmoor (several locations) has a surprisingly good 20 quid Sunday Roast with all the fixings that I enjoyed last time I was there.